Muranaka and Uchiyama have prepared an 18π-electron system that exhibits variable aromaticity in its tautomeric forms.1 The synthesized benziphthalacyanine 1 shows upfield resonances in the 1H NMR for the internal hydrogens: 1.89 ppm for the C-H proton and 4.67 ppm for the N-H proton. This indicates some weak diatropicity. 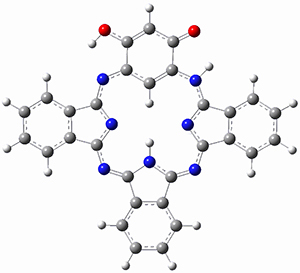 To address this interesting magnetic property, they reported B3LYP/6-31+G(d) computations on the model system 2 in its phenol 2p and quinoidal 2q tautomeric forms. 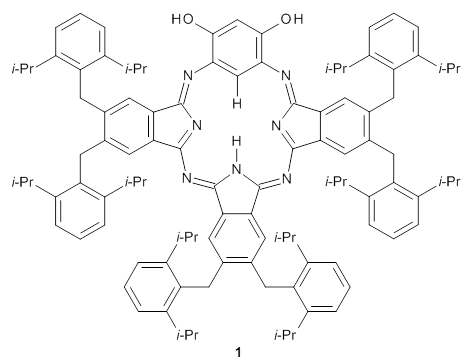 The optimized structures are shown in Figure 1. The phenol form 2p has NICS(0) and NICS(1) values of -6.77 and -6.04 ppm, respectively, indicating only modest aromaticity. However, the NICS values for the quinoidal from 2q are much more negative, -11.43 (NICS(0)) and -10.10 (NICS(1)) ppm, indicating a more significant aromatic character. The calculated chemical shift of the internal C-H is most telling: for 2q it is -4.55ppm but for 2p it is 0.97 ppm, in good agreement with experiment. Thus, 1 has an 18π-electron modestly aromatic periphery, with the phenol form dominant. There is no evidence of a 20π-electron periphery. Figure 1. B3LYP/6-31+G(d) optimized geometries of 2p and 2q. 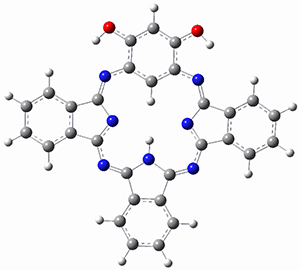 (1) Toriumi, N.; Muranaka, A.; Hirano, K.; Yoshida, K.; Hashizume, D.; Uchiyama, M. "18π-Electron Tautomeric Benziphthalocyanine: A Functional Near-Infrared Dye with Tunable Aromaticity," Angew. Chem. Int. Ed. 2014, 53, 7814-7818, DOI: 10.1002/anie.201404020.